I went into this book not really knowing what to expect but I did know that the Breakfast Club parallels were not something I was looking forward to. Yes, please don't hate me but I hate the alleged classic that is The Breakfast Club. Instead I found this really wonderful book. I always say YA is for more than young adults and 90% of the books I read in that genre prove me right. YA authors don't take the time to dumb down their books, they have rich stories and even deeper meaning than some "adult" books I've read, even from noted authors. 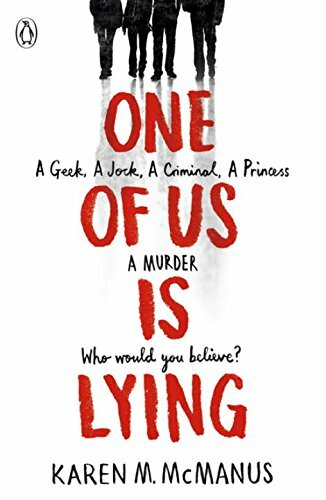 One of Us is lying follows four students following the death of one of their classmates in detention. Simon runs a gossip blog and basically is a bit of a jerk and I can't say I was entirely sorry to see him go. Don't worry, if outcast potential psychopaths are your thing, he pops back up from time to time. With our remaining detention kids we have Bronwyn, Addy, Nate and Cooper who amongst them provide a pretty varied range of characters. So many authors hide behind "I'm scared to not tell stories accurately" and thus don't even try, whilst I can't say for certain that Karen put a lot of research into any diverse characters in her story, I can definitively say she never made the characters come across as significantly "other" and that makes all the difference. I wish the rest of the literary world would catch up, there's few things sadder than loving books and never seeing yourself more literally involved in them. This book truly took me on a rollercoaster of emotions, I laughed, I screamed and I cried, and this is why I love YA. If anything, YA demands more of authors as teenagers are more prone to strong dislike or intense love of items.